Traditionally a Hawaiian instrument, the 4-stringed guitar-like ukulele has found a niche in popular music. Its unique sound brings an instant island tone to any piece of music. 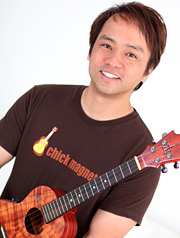 My KoAloha Story follows Alvin Okami, the owner of KoAloha Ukulele, and his journey into the craft. Alvin and his ohana (Hawaiian for "family") at KoAloha have been dedicated to crafting the highest quality ukuleles for almost two decades, but their story goes further into music and family, and how a small instrument can change lives and bring people together. Join us for a screening of My KoAloha Story and a special guest appearance by Hawaiian music legend Daniel Ho, who will perform prior to the screening.